Problem: You suddenly lose traffic for a hot keyword. Solution: Check to see if there are other outside forces causing that decline before launching an SEO campaign to reclaim that traffic. I have a client who runs a site that competes for some highly competitive keywords â€” some that garner tens of thousands of visits a month. (I know, lucky client.) Their website has been around for more than 10 years and has avoided getting on Google’s bad side by eschewing black hat SEO tactics. But I noticed, when I was tooling around inside the client’s Google Analytics, that their traffic dropped precipitously in a period of a couple weeks for a keyword phrase that was driving more than 10,000 visits/week for the site. Of course, being an SEO by trade, my knee-jerk reaction was to recommend that this client focus their attention on an SEO campaign aimed at better optimizing for this keyword phrase. After all, it was their number one keyword when the getting was good. And the bounce rate for the keyword was atrocious (93% average bounce rate). But the sudden drop gave me pause. So I checked the page to see if there was anything that would potentially get it penalized in the search engines. It checked out fine. So I looked to see if the landing page all this traffic was going to was okay. Quick aside: To see the landing page(s) right inside a Keyword Report in Google Analytics, simply click on the dimension dropdown under the Site Usage tab. As of August 2010, you’ll see all of your segmentation options to give more, well, dimension to your report. Most of their traffic went to one particular landing page that had several instances of that keyword, so it all made sense. What DIDN’T make sense was how this traffic came from nowhere in March 2010 and was gone by the end of June. Befuddled, I turned to Google Insights to see if there was a global downward trend for that keyword phrase that could provide some insight into the drop. I have to say that the discovery I made there was the strangest I think I’ve ever seen in my SEO career. 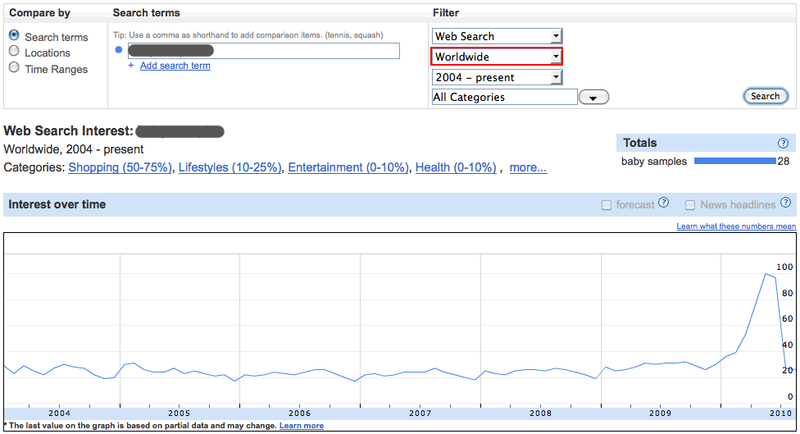 As you can see below, traffic for this keyword spiked in March 2010 and dropped back down in June. Okay, now my curiosity was piqued. Google Insights gives you the ability to segment by locale, so I scrolled down the page to see if one country stood out more than the others, and sure enough one did: China. 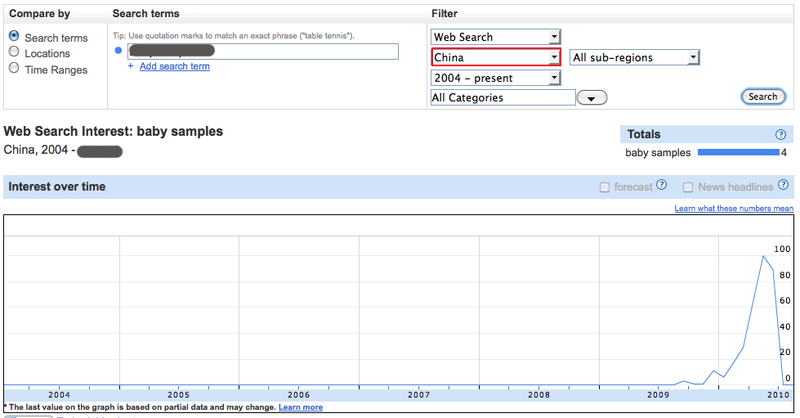 So I looked at just the relative search volume for that keyword from China. And whudduyaknow? So then I went back to Google Analytics and created an advanced segment that just looked at organic traffic from Google in China. (As you might imagine, Google Insights just looks at data from its own data centers.) I won’t go into detail about how to set up an advanced segment in Google Analytics, save to say that all you have to do is click on the drop-down menu to the right of Advanced Segments in the upper-right corner of your report, and click on the Create a new advanced segment link in the left side of that window. When you get inside the Advanced Segment window, you can drag out the Metrics and Dimensions you want to analyze. The easiest way to do that is to start to enter what you’re looking for in the filter window, e.g., source. Then drag it over and assign values. To add more, simply click either the Add “or” statement link or the Add “and” statement link. To decide which one you need, think of a Venn diagram. In our case, all three dimensions are required, so I used “and” statements. To test your segments, you can click the Test Segment button. There’s one in the top-right and bottom-right corners of the window. (Note: You will first need to name your advanced segment at the bottom of the screen in the Name segment field. Yeah, the workflow could be a little smoother.) 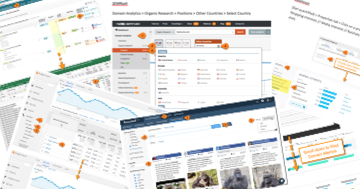 You will then see the number of visits associated with each segment populate to the right. You can also test segments as you add them, if you’re nervous. When you’re finished click the Save segment button to the right of your segment name, then select your segment from the Advanced Segments drop-down menu. To learn more about how to work with advanced segments in Google Analytics, check out this detailed video from Google’s Conversion University (it’s free). 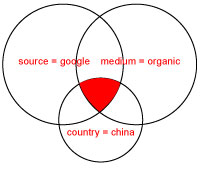 Since I wanted to see how much of the total traffic was coming from China via Google organic, I selected both the default All Visits segment and the Google Organic from China segment. And voila! 98.5% of my client’s traffic for this keyword came from China. So basically all of the traffic for this keyword phrase came from China and is most likely attributed in some strange way to the dramatic showdown between Google and China over censorship. It’s not my job to figure out what caused the spike and fall of this keyword that’s reminiscent of the movie Awakenings (sad, sad movie). My job was to let this client know not to waste time trying to chase this pipedream. It was an anomaly, and the traffic was riddled with a high bounce rate not necessarily because there was something wrong with the landing page but because the visitors didn’t speak English. The chances that looking at your keyword performance will reveal a pattern as strange as this one are pretty slim, but it’s still important to look at your keyword performance in context of data much broader than just your website. And Google Insights for Search is an excellent tool to accomplish that objective. I also liked how you linked to Google’s Conversion University, I tried going back through the URL to see if there are other audio slides to learn more, but nothing seemed to work… Any idea why? I’m not sure what you mean. What didn’t work?